Restaurant Design Inspiration – using ‘cool’ colours. A huge aspect of creating the overall atmosphere of a restaurant is colour choice and ‘cool’ colours maintain particular associations that have been proven to really work within the hospitality industry. Soft creams & light greys will always give a venue a classic feel that conveys style with a sense of reliability. With the added advantage of instilling a feeling of calmness, which could easily translate into an extended stay and extra sales. Green and browns also have a connection to feelings of relaxation and calm due to their relationship with nature. This, once again, could serve to help customers enjoy a prolonged experience within most types of dining establishments. Green, of course, is the best choice for a venue that is frequented by health-conscious diners looking for fresh, local or eco products or deli-style cafes that offer buffet type salads and gourmet sandwiches. Brown can be used alongside other colours as a foundation or base tone which gives this colour some versatility. 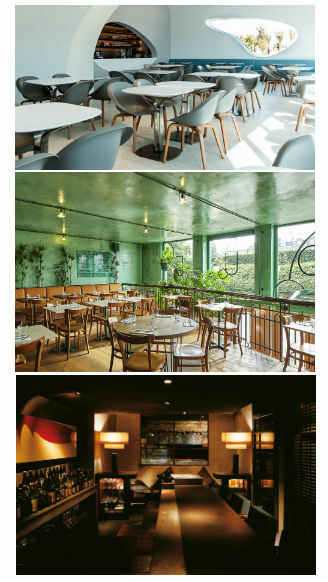 Venues that are decorated predominately with shades of brown have a home from home, have familiarity and dependability attached to them, that said, there remains a danger of creating drab and dull feel – gastro pubs need to add the brightness or freshness of an additional colour to avoid this potential problem of too much of a woody or earthy look. If you are intending to open a high-class venue, purple could be a contender. Often regarded as a regal colour and a colour connected to exotic places, purple exudes expense and sophistication. Alternatively, use of purple in order to attract young, modern thinking clientele, purple, paired with another rich colour, is a great choice for a drinks only venue such as a coffee house or city bar where the need to increase turnover from food is not a priority. The above guide should just be a good place to start thinking about this crucial element of design – if you have another colour in mind that best fits in with your current brand and you are keen to progress with a set idea, a good designer can help you make anything work.